What happened to all that clear, hard ice your commercial ice machine used to provide? Instead of producing hard ice with longer life and cooler temperatures, your ice may be softer and melting quickly. Your customers could be noting the white coloration of the ice too. What is causing this and how can you avoid getting soft ice from your commercial ice machine? Combine maintenance with filtration and the Scotsman Prodigy commercial ice machine, and you will get the hard clear ice your customers love. Water Dump Valve is Stuck – Good Quality water produces hard, crystal clear ice. However, ice is formed by moving over the evaporator and then the water dump valve expels the mineral heavy water. When that valve is stuck, you are going to get a lot of minerals in the water reducing the quality of your ice. Get inside every 30 days and clean your evaporator and check the dump valve. Preventative maintenance is always a good first step. Hard Water Does Not Equal Hard Ice – Mineral laden water degrades ice machine efficiency. Lime will separate from the ice and bond to the evaporator. In turn, you get a less efficient ice machine that is dealing with more mineral content in the water; the result is the opaque ice that is not a crowd pleaser. 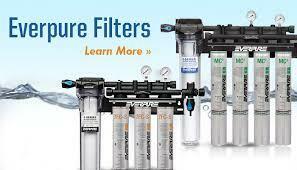 Start at the source and use a commercial water filter. Filtration can literally double the life of your commercial ice machine and help create the hard, clear ice you desire. Link below to get the right filter for your ice machine. Crystallization – Note how ice tends to have most of its impurities or whiteness at the center of the cube. As the water freezes, forming the cube from the outside in, the impurities are being pushed toward the center. The impurities are concentrated in the middle of the cube with no place left to go. Commercial ice machines partially solve this problem by constantly moving water over the freezing area. However, you need a commercial ice machine that literally senses the impurities. The Scotsman Prodigy Commercial Ice Machine has probes that monitor the total amount of dissolved solids and communicate to the dump valve how much water to dump thus keeping your ice hard and clear! Can we help you produce both hard and clear ice for your operation? Call us at 1-800-755-4777 and we will be glad to help you!